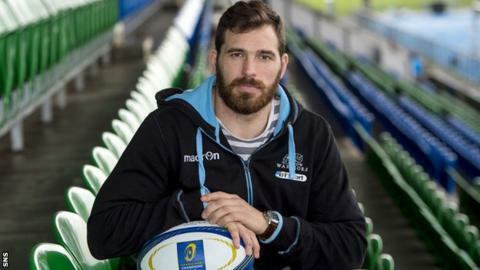 Scotland international Sean Lamont is determined to earn a new contract at Glasgow Warriors. Lamont, who will be 34 next month, is keen to extend his stay at the Pro12 champions, with his current deal due to expire at the end of the season. When asked about his future, Lamont said: "I've asked for another year. "I've got to earn and deserve another year, so I'll do whatever I need to do; if not then it will be boots up, but I'm sure there can be another year." Lamont is second only to Chris Paterson in the list of most-capped Scotland players, having represented his country in 101 Tests. Despite a professional career spanning 15 years, he feels he still has more to give. "I've put in some good speed times and I'm fastest in the squad at the moment, believe it or not," Lamont commented. "Physically I feel great, I still love rugby and want to keep going. On my side of things give me another four years, but it's the powers that be who will decide. "I love the club, they are a great bunch of guys and I suppose hanging around with the young boys keeps me on my toes." Warriors head to Wales to face Scarlets on Saturday in their next European Champions Cup match. When the teams met at Scotstoun last weekend Glasgow enjoyed a comfortable 43-6 victory, with powerful wing Taqele Naiyaravoro stealing the show with a hat-trick of tries. Lamont is certain the Welsh side will want to keep a special eye on the Fiji-born Australia winger this time around. "They can watch all they want - but they've got to try and stop him," said Lamont. "He's an absolute wrecking ball. It's nice to see him come into form and he's settled in well. "He's only 23 and if he wants any help from me I'll do anything I can. But there's not much coaching needing done on that side of things going forward." Glasgow sit third in Pool 3 with five points from their two games so far, having previously lost to Northampton Saints. And following their success in winning the Pro12 last season they are eager to make their mark on the European scene. "It's about another performance," added Lamont. "We need to get another bonus point ideally to help us qualify for the first time - that's the big one for us. "Having won the league last year we want to go one step further this time by doubling up in the league and getting a European title as well."